The Native American story of When Ghost Shirts Failed. Learn about the culture, stories, and legends of American Indians and their famous chiefs, tribes and wars. A Native American Story of When Ghost Shirts Failed to teach kids about Native Indians in a short, enjoyable, easy to read format. The battle of the Little Big Horn put the United States army in the West upon its mettle. Fresh troops were sent into the field. The posts were left with only corporal's guards. General Crook the Gray Fox, whom the Sioux now called Three Stars, steadily hunted the Crazy Horse Cheyennes and Sioux. Band after band they were defeated and made to surrender. The Cheyennes suffered the most. When they fled to the protection of Crazy Horse and his Sioux, Chief Crazy Horse would not feed them. He said that he had to take care of his Oglalas. Then the Cheyennes threw him away. They turned to the white chief. "Take us as soldiers," they offered. "We will go with you to fight the Crazy Horse Sioux. This is true talk." They all surrendered upon the Sioux reservation in South Dakota, and their best warriors were enlisted as scouts. Crazy Horse now was to be pursued by a great army of white men and red men both. The Cheyennes, the Crows, the Winnebagos, the Snakes, even reservation Sioux themselves, were aiding the soldiers. Colonel Nelson A. Miles, the Bear Coat, of the Fifth Infantry, found him, in the Wolf or Rosebud Mountains near the Custer battle ground, and shattered him, in January, 1877. In the spring he came in, to surrender to General Crook, at Fort Robinson, north-western Nebraska adjoining the Sioux reservation. In September he tried to escape, and was killed. That was the end of Crazy Horse, a fighting chief who never allowed anybody to ride ahead of him, in battle, and who always gave away everything he had except his bow and gun and war ponies. Sitting Bull and Chief Gall Sioux had retreated for the north. It is told in Boys' Book of Indian Warriors how the Bear Coat kept striking at them and breaking them into bits, until Canada was the only refuge outside the reservations; and how, at last, in 1881, Sitting Bull, too, surrendered. The Northern Cheyennes were at first placed upon the reservation of the Southern Cheyennes, in Indian Territory. There they sickened, and longed for their high north country, until they were made satisfied by their own reservation in the Montana which they loved. 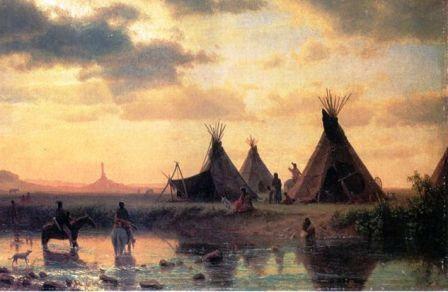 The Sioux were quiet upon their Dakota reservation. But in 1889 the United States took the only good lands from them. They saw themselves poorer than ever, and starving. Hope sprang up. Word came from the far west that a Messiah—the Christ of the Indians—had appeared. He promised life to the red people, death to the white people. The red people were to rule the land, as in the old days. Many of the tribes believed. The Sioux believed. They obeyed the teachings of the Messiah. They danced in Ghost Shirts of white cotton, which would blunt the white man's bullets. They grew restless, waiting for the promised time. When the Government tried to stop the dancing and the excitement, numbers of the Sioux ran away to the Dakota Bad Lands. At this time there were five reservation tracts for the Sioux, in South Dakota. The Hunkpapa and Oglala agency of Standing Rock was on the north. Next, there was the Cheyenne River reservation. Next, the small Brule reservation. Next, against the Nebraska line, the Rosebud reservation on the east and the Pine Ridge reservation on the west. The Bad Lands were a patch of rough country in the northwest corner of the Pine Ridge reservation. In the center there was a high plateau, approached by a trail twenty feet wide. From the Bad Lands the Ghost Dancers defied the soldiers. General Phil Sheridan was dead, and General Miles, the Bear Coat, was now in command of the western plains. When it was seen that the Sioux were in rebellion, Miles was ordered by the War Department to bring them back to peace. Forts and army posts bordered the Sioux reservations. General Miles had plenty of soldiers, within close call. Soon there were three thousand cavalry and infantry, under officers of the old days and of the new days, surrounding the reservations. He himself took post at Rapid City, on the railroad at the western edge of the Pine Ridge reservation. The troops were well armed. And what with the railroads, and the telegraph lines, the Sioux stood a poor show of escaping far from the Bad Lands. They would starve. The buffalo had vanished upon the plains, and winter enfolded all the country. Sitting Bull was shot dead by the Indian police while resisting arrest at his home upon the Standing Rock reservation. This happened December 15. So he was out of the way. And General Miles acted wisely. Instead of attacking the Indians, as in the old days, he treated with them. Couriers were sent to them by the agents, warning them that they could not possibly break through the troops. "Buffalo Bill" Cody had returned from a tour with his Wild West Show in Europe. He went to the reservations, to use his influence. All the Sioux knew Buffalo Bill. 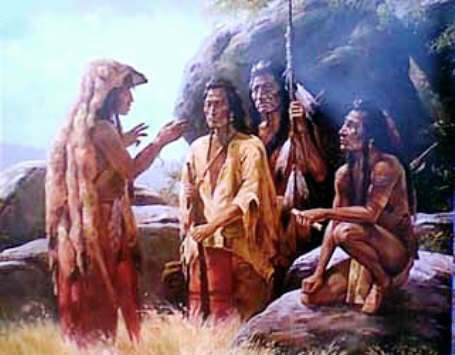 The Indians who had been in his show talked to their brothers and cousins. Big Road, who had fought at the Little Big Horn, and other chiefs, were enlisted, to talk. The Government did not cut off the rations. The commanders of the army detachments were instructed to be patient. The Bad Land bands began to come in peaceably. The soldiers did not use force, but only closed behind them, and followed from camp to camp. Hump, another Big Horn veteran and war chief, who was a leader of the Ghost Dancers, came in and agreed to help the Government. Matters looked good. But there was Sitanka or Big Foot of the Hunkpapas, who acted suspiciously. His village had been located beside the upper Cheyenne River, outside the Cheyenne River reservation, and he did not wish to move it. So Lieutenant-Colonel Edwin V. Summer, of the Eighth Cavalry, whose father, General Edwin V. Sumner, had been a noted officer of the old dragoons, was ordered to bring Big Foot to Fort Mead, seventy miles west. Big Foot explained to Colonel Sumner that he was not planning any wrong, and that he was going with his people to the Cheyenne River agency, to get rations. The agency was eighty-five or ninety miles east from the village. He started. Colonel Sumner rode after, and turned him back.. On the way back, up river, the Big Foot people refused to go beyond their village. When they reached it they said that here they were, at home, where the Government had said that they should stay. They numbered over three hundred. Colonel Sumner decided that it might be best to let them go to the agency, if they wished, and he would arrest Big Foot there. But the next day, December 23, they all struck their teepees and marched south, toward the Pine Ridge reservation and the Bad Lands. The reason might have been, that they were frightened by another column of soldiers, closing in on them from the east. They were afraid of being punished because they had taken in some runaways from tire Standing Rock reservation. December 28 four troops of the Seventh Cavalry under Major Samuel M. Whitside headed off the Big Foot people before they had reached the Bad Lands. "My people are sick. We are willing to do what you tell us to do," Big Foot said. Many Sioux were indeed sick. They had been taken from their log houses and placed in tipi camps, around the Pine Ridge agency buildings, until the troubles simmered down. It was winter weather. "I am not here to talk," Major Whitside answered. "You must surrender unconditionally or fight." The Big Foot people raised the white flag, and went with Major Whitside into the Pine Ridge reservation. Camp was made on Wounded Knee Creek, twenty miles northwest of the agency. Colonel James W. Forsyth, whom the army called "Tony" Forsyth and who was not the "Sandy" Forsyth of Beecher's Island, arrived with four more troops of the Seventh. Captain Allyn Capron was here, with four Hotchkiss machine-guns of Battery E, First Artillery; and Lieutenant Charles W. Taylor, with a company of Sioux scouts. The four hundred and seventy soldiers kept the one hundred and six warriors of Chief Big Foot under guard. General Miles had planned to take the guns from the Big Foot people, and then send the people up to their own reservation. He looked for no trouble. The cavalry, mounted and dismounted, and the scouts, surrounded the Big Foot camp; the Hotchkiss guns were placed so as to cover it. In the morning of December 29 the Big Foot people were asked to surrender their arms. They had raised the white flag, again, on a pole in the center of the council ring. Chief Big Foot was very ill with pneumonia. Colonel Forsyth had given him a tent and put a stove in the tent, and had sent a surgeon to treat him. Other sick persons were given other tents. The weather was cold. The warriors came out of their teepees and sat before them; but they turned over only two guns. So Colonel Forsyth ordered the soldiers to search the tents and teepees, for guns. They found thirty-eight more. The most of these were old and worn out. The search irritated the Big Foot people. Dismounted cavalry had been drawn in very close, so that they were only ten paces from the warriors. The searching squads ransacked the bedding and other furnishings, to find the guns. And the Seventh cavalry troopers glared, for they remembered Custer and the Little Big Horn. Yellow Bird, the medicine-man, now made the trouble break out. He had been walking about, blowing upon an eagle-bone medicine-whistle, and telling the Sioux, in their own language, that they wore Ghost Shirts, the bullets of the soldiers could do no harm and they should fight. The officers did not know what he said. Then one of the searching soldiers stooped to lift the blanket of a warrior. The warriors all sat enveloped in their blankets. Underneath the blankets there were rifles, revolvers, knives and clubs. And then, on a sudden, Yellow Bird stooped also, and threw a pinch of dust into the air. As quick as a flash young Black Fox, a foolish brave, whipped out his Winchester and fired at the soldiers. That was enough. The warriors sprang from their blankets. The soldiers dared take no chances—they delivered a volley at close range, which mowed down half the warriors. The other warriors had fired—they charged with revolvers, knives, clubs and hatchets; they broke through dismounted Troops B and K. The Hotchkiss machine-guns, outside, opened with two-pounder shells which streamed iii at fifty a minute; in ten minutes two hundred Sioux and sixty soldiers were lying upon the snowy ground. The tents and teepees were burning, the remaining Indians were fleeing, pursued by the Hotchkiss shells. The fighting was soon over. The Seventh Cavalry, remembering Custer, had killed right and left. The recruits in it lost their heads; they shot at every Indian in sight. And the Hotchkiss shells were terrible. Chief Big Foot had been killed, in front of his tent. Captain George D. Wallace of Troop K, who had been a lieutenant at the Little Big Horn, was dead by bullet and hatchet, in the council ring. First Lieutenant Ernest A. Garlington of Troop K was wounded seriously. Second Lieutenant Harry L. Hawthorne of the Second Artillery, serving with the Hotchkiss battery, had his watch driven into his side. Captain Capron was seared by a bullet that passed half around him between skin and clothing. In the excitement even Father Craft, the good Catholic priest of the agency, whom the Sioux loved, was mistaken for a soldier and stabbed—but he kept on attending to the dying. In that one furor of fierce fighting thirty-one soldiers had been killed, and about the same number wounded. Of the three hundred and seventy Sioux, more than two hundred had been killed, and many others wounded. The whole thing was a great pity. Hearing of the battle, Indians from the Pine Ridge agency galloped in and attacked the troops. Chief Two-strike, whose name means Knocks-two-down, and another force attacked the agency itself. The Sioux police there held them off. The Catholic mission, five miles out, was besieged; the Seventh cavalry spurred to the rescue and was surrounded. Then Major Guy Henry made his famous ride of one hundred and ten miles in thirty hours, with his black Ninth Cavalry. Four thousand Sioux gathered, in position to resist the troops. The alarm of a great uprising spread into Nebraska and western Iowa and into Minnesota; prayers were offered in churches, for protection from the red men. The Nebraska state militia were mobilized. But much of that alarm was far-fetched. After several skirmishes, the Bear Coat, who understood Indians, and was respected by them, and who knew the wrongs that had made the Sioux desperate, persuaded the Sioux to surrender peaceably. He promised that he himself would talk for them to the Government. So they came in on January 12, 1891; they gave up their guns; they were supplied with food. Little property had been damaged, outside the reservations; only one settler was killed. Wounded Knee was scarcely a battle; it was a panic. But it ended the pitched border-battles of the white men and the red. This story of When Ghost Shirts Failed is featured in the book entitled the Indian History for Young Folks by Edwin L. Sabin and was published by George W. Jacobs and Company in Philadelphia in 1920. The Native American Indian Story of When Ghost Shirts Failed provides an opportunity to read about the life and times of Native American Indians and many of their great wars, chiefs and famous leaders. A Classic Short story about When Ghost Shirts Failed for kids and children of all ages. This short story of When Ghost Shirts Failed is great to read to kids and children enabling them to learn about history in a fun way. This very short story contains information about the famous chiefs of Native Indian tribes and their wars, battles and conflicts. This short Native American story has been selected to keep the attention of kids and children of all ages. Read our free short story online about When Ghost Shirts Failed. This free, online short story about the people of famous tribes Native American Indians to increase knowledge and understanding of the indigenous people of North America and the wars and battles they fought. The Story of When Ghost Shirts Failed. Discover the vast selection of pictures which relate to the Stories, History and Culture of Native Americans. The pictures show the clothing, War Paint, weapons and decorations of various Native Indian tribes that can be used as a really useful educational history resource for kids and children of all ages. We have included pictures and videos to accompany the main topic of this section - The Native American story of When Ghost Shirts Failed. The videos on this website enable fast access to the images, paintings and pictures together with information and many historical facts. All of the articles and pages can be accessed via the Native Indian Tribes Index - a great educational resource for kids.